I’ve just realised that I haven’t made enough of some of the great people I’ve met who are also undergoing this amazing green journey – downshifting or re-moulding their lives to their views of the new reality we face. There are so many of them I won’t attempt to get them all into one post, so here is a teaser for you . . .
La Ferme de Sourrou is where I see myself in another life – without the daily schoolrun or the pressures of catchments and SATs. 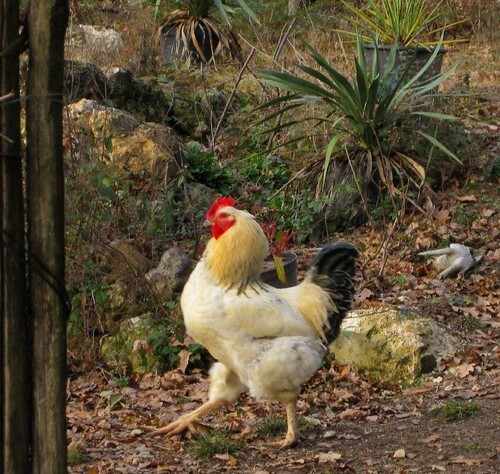 Amazing tales of self-building and self-sufficiency, wonderful gardens and animals – read more at lafermedesourrou.blogspot.co.uk – and have a look at the gorgeous photos. This post was triggered by seeing this photo posted over at Powerswitch on avoiding the need for refrigeration. I think it is just such an uplifting picture – amongst discussions of doom, gloom, and rampaging hordes seeing it just makes my heart ache. The sheer organic nature of the construction, the multiple levels of greenery, the life just bursting out of the page . . . just . . . breathtaking. The photo was from HardWorkingHippy from La Ferme de Sourrou, I’m not sure where to start on describing what I found most inspirational: they are living off-grid, have built their own gorgeous house and are now building an impressive extension. They have an Angora goat and sheep farm, and also keep pigs and chickens, and are making great strides towards self sufficiency. Plus, they take really great photos! Here are some of the most beautiful ones I’ve found so far – their woodburning stove and this beautiful garden layout. Maybe I’ll skip work today, just curl up with the laptop and read their site from start to finish!